Biloxi, MS – May 12, 2016 – Christopher Wick, Founder & Social Media Consultant, SMM International, was invited to speak with Rotary members by Stephen P. Theobald, President, Rotary of Edgewater, on May 11 and Mark W. LaSalle, Ph.D., President, Rotary of Moss Point on May 12, 2016. Rotary International service efforts include promoting peace, fighting disease, providing clean water, helping disadvantaged mothers and children, supporting education, and growing local economies. Christopher lectured on “How to Grow Your Rotary Membership with Internet Branding and Social Media Secrets.” He exchanged his proactive insight of the benefits and value for social media in the business world, and how to develop and utilize social media skills to market area businesses or not-for-profit charitable organizations in the BIloxi, MS local community. Rotary International is an international service organization whose stated human rights purpose is to bring together business and professional leaders in order to provide humanitarian services, encourage high ethical standards in all vocations, and to advance goodwill and international peace Rotary unites people from all continents, cultures, and occupations around the world. SMM International is headquartered in Houston, Texas. 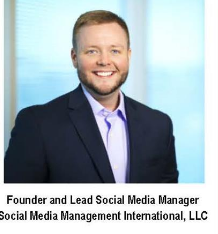 For more information about SMM International, visit www.smminternational.com.